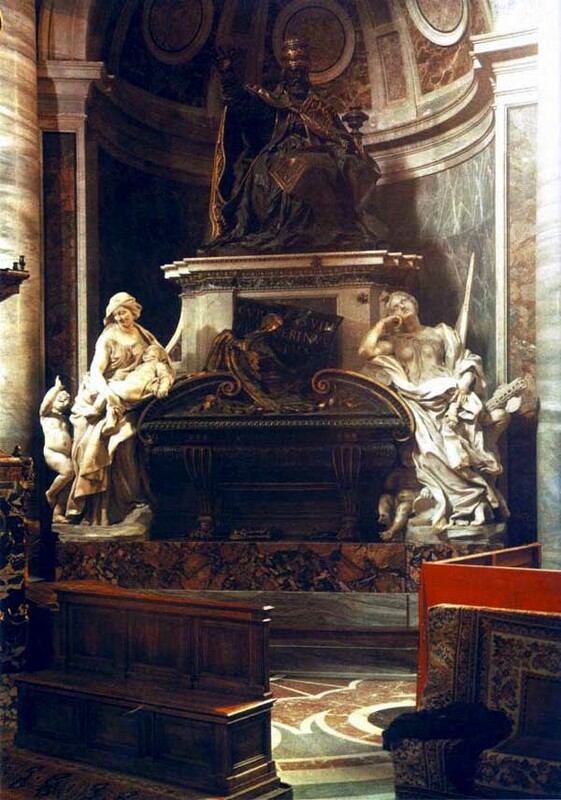 The pope is represented rising from his throne to give his blessing; below there are allegorical statues of Sacred Wisdom (left) and Disinterestedness (right), carved by Gaspare Sibilla. The first figure holds a book in her right hand and has a gilded sun on her breast. The second is flanked by a stout little angel who is vainly proffering a cornucopia filled with jewels and money. 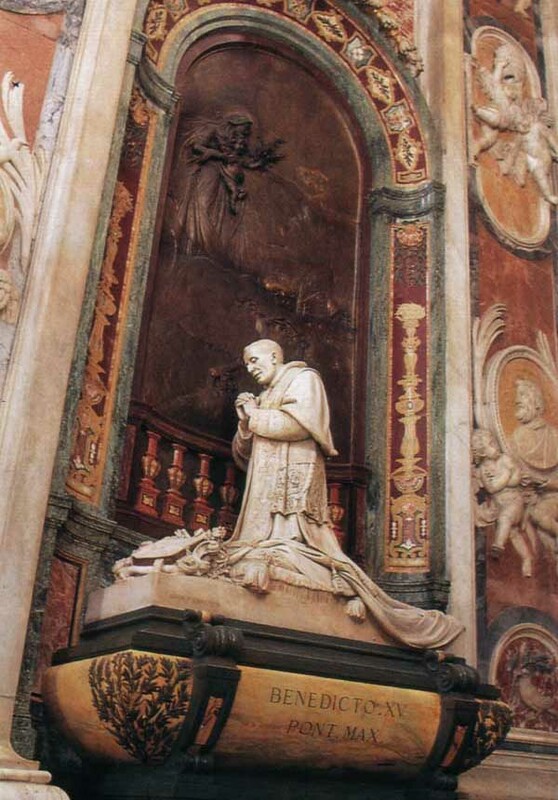 Monument to Benedict XIV, built in 1769 by Bracci, which refers back to the late Baroque tradition, introducing the novelty of a Pope standing and blessing his flock with a rather declamatory gesture. 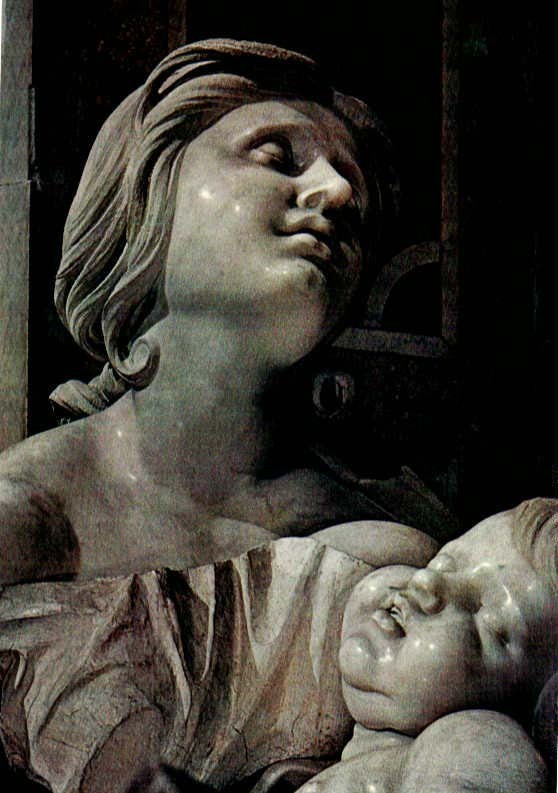 More convincing, as often is the case in these works, are the lateral statues of Wisdom, by Bracci himself, in memory of the erudition of the Pope, and Gaspare Sibilia's Unselfishness, shown refusing the gifts brought by a small putto. With a simple pyramid-shaped arrangement, based on the upper central opening, Bracci created a work with classical compositional essentiality, returning, however, to the 17th-century preference for multi-colored designs, which is also evident in the large niche that contains the sepulcher. 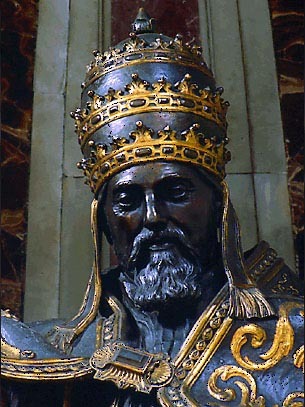 In addition, the artist introduced an innovative feature for St. Peter's Basilica (which he had already experimented in the sepulcher of Pope Benedict XIII Orsini in the church of Santa Maria sopra Minerva): the Pope is depicted standing in the act of blessing in what is decidedly an emphatic position which does not conform with the calm nature of this Pope from Bologna. The act almost certainly refers to the Apostolic blessing given for the Jubilee of 1750. The Pope, who seems to have just risen from the rear throne, is completing an official and majestic act, which is rendered as such by the continuity of its representation. Two allegorical figures are located on the sides of the base of the main figure. They are seated on wainscot and, with one arm resting on the top jamb of the door, give fluidity to the composition which indeed is harmonious and not overly restricted. To the left is Knowledge, delicate but just as beautiful, gazing toward the Pope. It alludes to the profound culture of Benedict XIV, author of a fundamental treatise on the canonization of the Saints. On the right is Indifference, an unusual element in the series of Allegories; executed by Gaspare Sibilia, it lacks the spontaneity in its expression of relinquishing riches, being offered by a flying angel, inserted at the end and rather disjointed from the compositional ensemble. The monument is one of the few works, in the extensive series of the 17th and 18th centuries, that does not include a sarcophagus with a bas-relief. Only an epigraph is inserted on the front of the base. Died of kidney disease, fever, and inflammation of the lungs at age 83. His last words were, "Our Lord died under Pilate, I shall die under Pontius" (Pontius was his doctor). 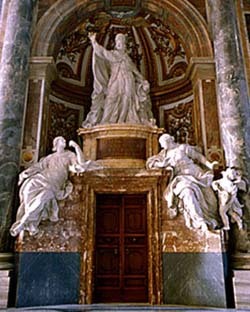 The 64 cardinals he created during his reign paid for the marble monument in St. Peter's, on which the pope, carved by Pietro Bracci, stands majestically above a doorway while Knowledge (also Bracci) looks up at him longingly on the left and Temptation (by Gaspare Sibilla) sits on the right. Benedict's right hand is extended in a gesture that he never used, and his left hand is behind him, holding a cherub by the hair - although the Romans like to say that he's shaking off the remnants of his last pinch of snuff, to which he was addicted. Elected after the longest conclave in modern times (six months), Benedict XIV was the author of the first papal encyclical, Ubi Primum (1740), on the duties of bishops. He was elected pope after having emerged as a candidate only at the very end to everyone's surprise. At one point in the proceedings, the witty and good-humored Cardinal Lambertini remarked, "Do you wish a saint? Take Gatti. A politician? Take Aldovrandi. But if you wish a good man, take me!" Although it was clear that he was only joking, the cardinals eventually decided to elect him. There had been 254 ballots on which Cardinal Lambertini had not received a single vote! Although Benedict XIV was a man of the time theologically and spiritually, many Protestants and agnostic scholars respected him for the breadth of his scholarly interests and for his support of the arts and sciences. He wrote a circular letter to all the bishops of the world. 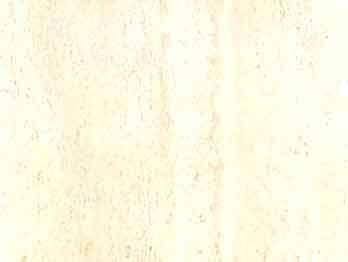 Entitled Ubi primum, it concerned the duties of bishops and is generally regarded as the first papal encyclical. His book on the making of saints, De servorum Dei, was often reprinted and remained the classic treatment of the subject for many years. 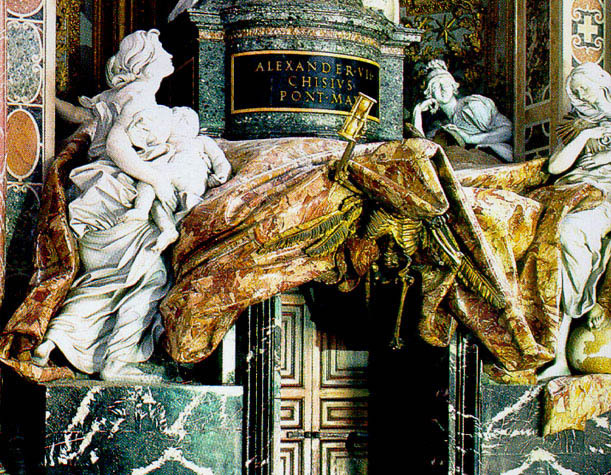 He was buried in St. Peter's, where he is memorialized by a striking monument by Pietro Bracci, erected through the financial contributions of the sixty-four cardinals he had created during his pontificate.